It wasn’t hard to tell how much winning the FIFA Ballon d’Or award meant to Cristiano Ronaldo. 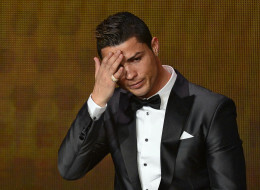 Upon being named the world’s most outstanding soccer player of 2013, Ronaldo teared up during an emotional acceptance speech at the award gala in Zurich, Switzerland on Monday. The 28-year-old Portuguese forward ended an unprecedented four-year winning streak by Lionel Messi to take home the coveted prize for the second time in his career. Messi had won the past three FIFA Ballon d’Or prizes and taken home the Ballon d’Or in 2009 before it was merged with the FIFA World Player Of The Year prize. With Messi battling injuries in 2013, Ronaldo racked up goals at a blistering pace for Real Madrid and lifted Portugal into the 2014 World Cup with an incredible performance in a playoff against Sweden. In 59 games for club and country in 2013, Ronaldo scored 69 goals.